I'm proud to announce that we (OK, just me) at Netflix Stream have just received our (my) first blog award from RamblingHutch over at Sporadic Sporkitudes (she's really funny go check her out). 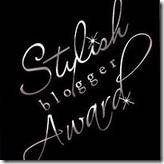 That's right ladies and gentleman red and white must be the new black because Netflix Stream has been awarded the prestigious Stylish Blogger award. The rules for accepting this award are that I need to tell you all seven things about myself. This isn't really a personal blog so if you want to learn about what's on my mind, head over to my other blog: Notes From Underground. So, instead of talking about myself I'd like to recommend seven movies/shows that I saw long before I started this blog but I think are pretty awesome and are available to stream on Netflix. To add these movies to your queue just click on the title. A Clockwork Orange. If it were physically possible for two men (one dead) to have babies I would totally let Stanley Kubrick inseminate me. A Clockwork Orange is a controversial classic that is filled with all sorts of awesome, creepy, scary, strangey goodness. If you've never seen this classic, queue it up. It'll either blow your mind, make you insane, or even possibly both. Dexter. If you've never seen this incredible Showtime series I have to ask, what the hell is wrong with you? Michael C. Hall brilliantly plays Dexter who is a serial killer that works for the police department and kills other killers. If you aren't adding this based on the premise alone I have to seriously question whether or not I even want you reading my blog. Amelie. As you may or may not know I'm in love with Audrey Tautou, and this movie is part of the reason why. She's a brilliant French actress that just oozes mischief and adorableness. Yes, I know it's a French film so for some of you that will automatically turn you off to it but you shouldn't let it. This is a highly entertaining movie and I promise you'll love the ride. I know your skeptical guys, but if you watch and love this movie there is a strong possibility you will get laid just by telling the right girl that this is one of your favorites. Avatar: The Last Airbender. Don't let the awful M. Night Shyamalan adaptation of this incredible children series dissuade you from checking this out. Yes, it is a kids show, but it's probably one of the best kids shows of all time. I watched the three seasons of this cartoon in the span of about a week. It really draws you in and has a surprising amount of depth. Whether you have kids or not you should check this one out. Jackie Brown. To me this is Quienten Tarantino's forgotten movie and in my opinion it belongs right up there with all his other classics. The dialogue and acting are as cool and interesting as anything else he's ever done. If you skipped over this one or just haven't seen it for a while I recommend giving it another look, you'll probably be surprised how good it is. On the Waterfront. Marlon Brando is one of the greatest, if not the greatest, actor of all time. In On the Waterfront Brando gives one of his best performances that will grab you by the throat and make you pay attention. He is unpredictable, incredible and stunning in this classic film. You owe it to yourself to give it a look. My Name is Bruce. It wouldn't be right if I didn't include some B-Movie goodness on this list and who better to represent that then B-Movie king Bruce Campbell? In this tongue-in-cheek send up of B-Movies and himself, Cambell plays himself but when a demon attacks a small town everyone expects him to be the hero he was in movies like Evil Dead instead of the actor he actually is. He ends up battling the demon and hilarity ensues. Now I'm supposed to give this award out to 15 people, but considering I don't even have that many followers that definitely is not happening. Also, I don't like having people feel obliged to write a whole post about a blog award when they really don't need to. With that being said I would like to share the links to a few people that comment on my blog regularly and if you want the award by all means take it! Tanya at I DARE You to Make Less Sense. Ivan at The United Provinces of Ivanlandia. Thanks to all of you for supporting this weird little hobby I have and thanks again to RamblingHutch for the award. Congratulations! I really Red and it looks good with white. Holy guacamole! THANKS! I, too, love free stuff and awards, and accept this with as much grace as I can. I'll put up a notification at Ivanlandia in a day or two. PS: And congratz to you, Mr. C! Ivan: No problem man, always enjoy hearing your thoughts. Well aren't you sweet? Thanks for the movie recommendations too! I agree with you on "Dexter". I have a neighbor who's always asking for TV show recommendations, and every single time I suggest "Dexter"--and he always ignores me! What is that all about??? Oh well. His loss. "Dexter" is my favorite thing on television, bar none. TB: I can't argue with that. It is an incredible show. Haha, your Clockwork Orange description cracks me up! Well done, you! One of my favorites too, though I'm not sure I can make myself watch it again. Yes, it's possible. RamblingHutch: I'm glad you enjoyed it. It is kind of a hard movie to watch, in a good way at least. I don't think any other movie has had as many cringe worthy moments as that one.